The San Diego County Board of Supervisors did not heed the calls of residents who sounded off Wednesday against its plan to hold this year’s budget hearings during the day, rather than at night as has been the case in recent years. 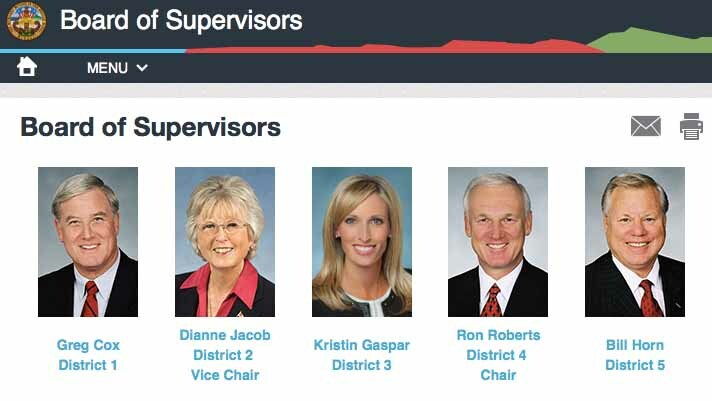 Deriding the board as out of touch and lacking transparency, the half-dozen who addressed the supervisors said the plan was a blow against open government because far fewer people can attend meetings during the day to offer feedback on the county’s $5.7 billion budget blueprint. The board in December voted to set its 2018 calendar. Rather than schedule budget hearings at night as it had in the last two years, the supervisors decided to schedule them during the day. Supervisor Greg Cox at that meeting suggested holding a nighttime hearing so as to not “shortchange the public,” but the suggestion failed to garner any support. Supervisor Kristin Gaspar, who is now the board’s chair, said a new online portal she spearheaded would allow for community groups to submit their grant application presentations online and ensure that any residents who wished to offer feedback could do so. She also said there were very few people at the 2017 nighttime hearings, outside Service Employees International Union representatives. “I know it seems as though we’re limiting the ability for the public to speak, but the reality is … there are several days and budget hearings in which community groups could come down and testify before this board,” she said. Supervisor Bill Horn suggested that those who work during the day could take time off from their jobs if commenting on the budget is important to them. Local SEIU President David Garcias pushed back against that reasoning. “A lot of these workers can’t afford to take a day off from work,” he said. Paola Martinez-Montes, director of the Alliance of Californians for Community Empowerment, said some people, especially those with lower incomes, do not have access to a computer and therefore are being shut out of offering public input. Gaspar said the board could take only one action in response to the feedback: to refer the matter to the county administrator for review. It did not do so. A spokesman for the Invest in San Diego Families Coalition, which gathered the speakers, said the group will always push for transparency in government but has not yet determined how it will respond to the board’s inaction.